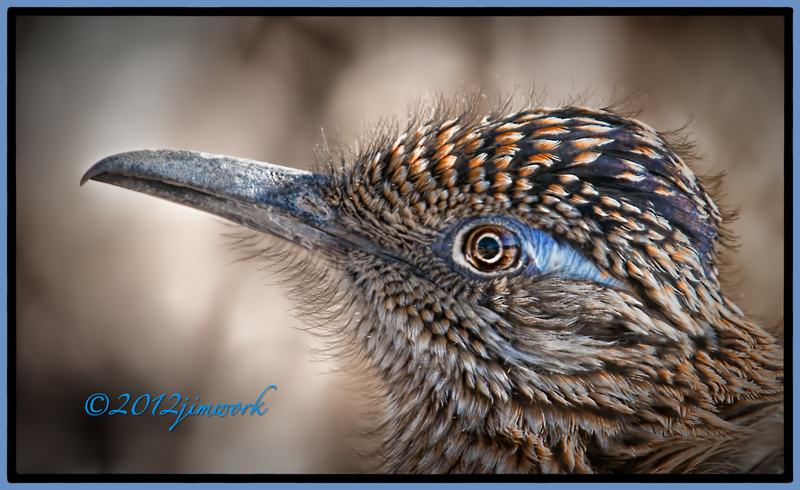 The Roadrunners (Geococcyx californianus) down in Big Bend are always a treat to photograph. Much like their cartoonist character, they are quite comical and seem to show off, posing, jumping and giving you the eye. This one was using the early morning Big Bend sun to warm off the chill. Roadrunners are the official state bird of New Mexico even if confusingly known as the “Chapparal Bird”. A group of Roadrunners are collectively, and fittingly know as a “race” or “marathon”. Great colors, textures, and comp Jim! Wow, that eye! the blue! the beak! wow!